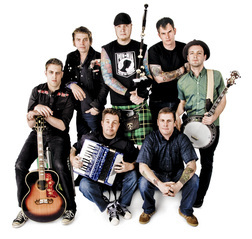 It's really no exaggeration to say Dropkick Murphys changed my life. They were essentially the first 'proper' band I listened to, coming along at a time when my CD collection was dominated by Busted (hell yeah!) and at a push the odd Chilli Peppers or Foo Fighters title. My musical tastes have developed quite a bit since then. These days, records like The Velvet Underground & Nico, If You're Feeling Sinister and The Midnight Organ Fight tend to hog my listening, but even so the Boston punks remain among my very favourites. I still attend their gigs, wear their T-shirts and eagerly anticipate each new release, and the recent announcement of an eighth studio LP set the entire process off again. Called Signed And Sealed In Blood, the album is set for release on January 8. and thematically at least will mark a departure from concept-driven previous effort Going Out In Style. "There's an upbeat, party vibe to it," claims bassist and founding member Ken Casey. "It's not that the last album wasn't fun - it was, but it gave me a couple migraines along the way. This time we cut loose." 2012 may not be over yet, but next year already looks rich with promise, and it wouldn't surprise me at all if this winded up being its first highlight.